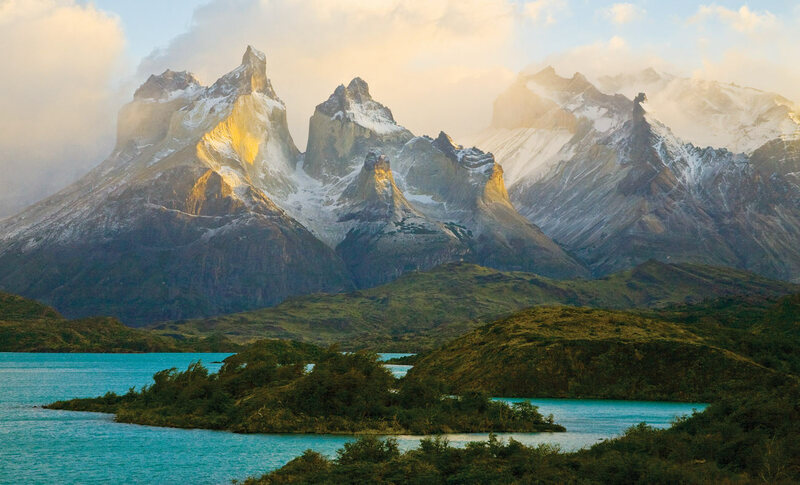 Carved by fjords and capped by glistening glaciers, Patagonia is a natural wonderland. Cruise through a landscape of thick forests and icebergs to the tip of Cape Horn and the Strait of Magellan. Then continue to Patagonia’s crown jewel—Torres del Paine National Park—and end our journey in Santiago, Chile’s vibrant capital. Follow Patagonia’s pristine fjords past vast glaciers, and trace the voyages of great explorers around the legendary Cape Horn. Encounter unique wildlife, including guanacos, rheas, gray foxes, and Magellanic penguins. Spend three days hiking and horseback riding amid the granite spires, glacial lakes, and waterfalls of Torres del Paine National Park—from our base at Tierra Patagonia, an exquisite National Geographic Unique Lodge of the World with stunning views of the park. Enjoy a tango performance in captivating Buenos Aires and venture into the colorful artists’ quarter of La Boca. Arrive this morning in Buenos Aires, the capital of Argentina. Transfer to our hotel in the heart of the fashionable Recoleta neighborhood and explore the nearby galleries, museums, and cafés. Enjoy a tango performance at our welcome dinner tonight. Spend the day discovering Argentina’s cosmopolitan capital, known as “the Paris of South America.” On a city tour, see the remarkable Recoleta Cemetery, burial site of Eva Perón. Continue to the historic presidential palace, La Casa Rosada, and the cathedral in Plaza de Mayo. After lunch, explore the cobblestoned lanes of San Telmo, as well as the colorful artists’ quarter of La Boca. Weather permitting, take Zodiacs to the legendary Cabo de Hornos (Cape Horn) for a panoramic view from the southernmost tip of South America. Later, explore Wulaia Bay, where Charles Darwin landed during his voyage on the H.M.S. Beagle. Choose one of two walks to experience the spectacular beauty of the Magellanic forest. As we navigate the Magdalena Channel, spot penguins, dolphins, sea lions, and Andean condors. Cruise through majestic Agostini Sound and disembark for a closer look at Águila Glacier. During an easy walk on shore, take in spectacular views of the brilliant blue-and-white ice set off by black mountains, and learn about the geological forces that shaped this dramatic land. Take a morning walk on Magdalena Island, home to a colony of 120,000 Magellanic penguins. Disembark in Punta Arenas and continue across the southern pampas, looking for herds of guanacos and rheas, gray foxes, Patagonian hares, and black-necked swans. Settle into our spectacular hotel—a member of the National Geographic Unique Lodges of the World collection—for the next four nights. During the next three days, tailor your exploration to your interests, choosing among a variety of hiking and horseback-riding excursions in the park. Discover Grey Lake and its incredibly blue sculpted ice; hike through beech forests along the shore of Laguna Azul; and marvel at rock paintings left by Aonikenk Indians, some of the earliest inhabitants of the region. Photograph wildlife near the northern limits of the park or relax at the hotel, taking advantage of its wonderful amenities. Enjoy evening lectures, and cap off your stay in the park with a festive barbecue in the company of local gauchos, getting a glimpse into traditional Patagonian cowboy culture. Today, drive to Punta Arenas airport for the flight to Santiago, stopping for lunch along the way. Arrive in Santiago this evening and check in to our hotel. Spend a full day exploring Santiago. On a walking tour of the city center, see the elegant Plaza de Armas, Palacio de la Moneda, and the 18th-century Metropolitan Cathedral. View the impressive collection at Santiago’s Chilean Museum of Pre-Columbian Art, and enjoy a farewell celebration at a Chilean winery. This evening, transfer to the airport for your flight home.